Welcome to All Sensors “Put the Pressure on Us” blog. This blog brings out pressure sensor aspects in a variety of applications inspired by headlines, consumer and industry requirements, market research, government activities and you. In this blog we’ll be discussing the pressure used to detect tsunamis. It has been five years since the Tsunami that devasted the Japanese coast. In 2004, Thailand experienced the impact of a tsunami as well. The tsunami is a direct effect of an earthquake somewhere in the region but the quake could be thousands of miles away. Typically, the seismic activity is initially detected by accelerometers. However, tsunami warnings also come from distributed pressure sensor measurements and a system called DART for Deep-ocean Assessment and Reporting of Tsunamis. After the seismic activity is detected, tsunami waves propagate across the ocean and each DART monitoring station measures the height and time of each wave in a bottom pressure recorder (BPR). This data is combined with other inputs to develop a tsunami forecast that can be a watch, warning or evacuation depending on the severity. The frequency change of a Bourdon tube pressure sensing site in a DART system is measured by a quartz crystal and the data is transmitted from the bottom of the ocean to a buoy at the surface and then to a satellite and finally to a tsunami warning center. Welcome to All Sensors “Put the Pressure on Us” blog. This blog brings out pressure sensor aspects in a variety of applications inspired by headlines, consumer and industry requirements, market research, government activities and you. In this blog we’ll be discussing the pressure in storage tanks. The weight of any liquid results in a pounds per square inch (PSI) or other values of pressure reading depending on the height of the fluid and its density. In addition, due to volatility, there can be additional pressure associated with a confined liquid. This is especially true for gasoline and other petroleum based fuels. For safety purposes, pressure readings are made at many locations in a fuel storage and transportation facility. For on the spot readings by an operator, many readings continue to be based on using mechanical pressure gauges. However, with the ease of wirelessly transmitting readings, and availability of pressure sensors that can handle interfacing to a media such as gasoline, fuel oil, diesel or others, the electronic data can be sent for remote collecting, monitoring and file keeping. Sensors such as All Sensors CPM 602 ceramic sensors can provide data from 30 to 6000 PSI. 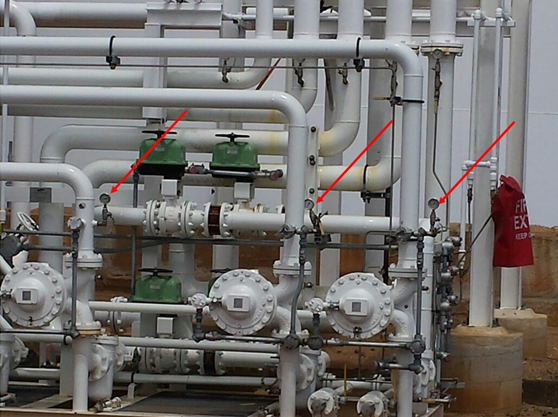 In the midst of complex material transfer plumbing in this storage facility, three pressure gauges are easily identified between valves and connections.